Johann Friedrich Wilhelm Esprit Boucher (b. in 1798), a native of Hamburg who was in New York during the 1830s and in Baltimore (with a second wife and young family) during the 1840s and 1850s. Joseph Fowler (c1796–1859), “of London,” to New York in 1820. It is Joseph – and his father-in-law Judge John Lawrance (1750–1810) – who provides the most frustrating of brick walls, as both men were prominent figures in the New York of their day. Joseph Fowler apparently met his future wife in England or on the Continent, as he arrived in New York in late 1820 and promptly married Emily Ann Lawrance (1792–1855). An heiress with her sisters and their Lawrance and Allen half-siblings, Emily’s appearance in a variety of legal maneuverings in New York’s Chancery Court help to trace the family and their holdings. Joseph went on to financial prosperity and social success of his own, and he was at one time the acting British Consul in New York as well as a perennial officer of the St. George’s Society. 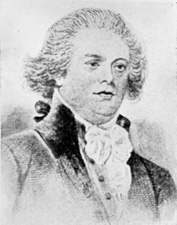 John Lawrance – an aide to George Washington, judge advocate general at the trial of John André, the first congressman from New York City, Senator from New York, and in 1798 president pro tem. of the Senate – was the son-in-law first of General Alexander McDougall and then John Lawrence, a former Mayor of Philadelphia. His second wife, Elizabeth (Lawrence) (Allen) Lawrance, was a first cousin of Margaret (Shippen) Arnold, and the Lawrence and Francis families were leading families of the mid-Atlantic colonies. And yet … Joseph Fowler appears out of nowhere in 1820, said to be of London at the date of his marriage. Which Joseph Fowler of London was he? There is a tantalizing hint of something more in the fact that his wedding in New York was noticed in a Cumberland newspaper in 1820, but even there he is identified as “of London.” He has a biography in the records of the St. George’s Society, but no clues about his origins are offered. His three children were Joseph D. Fowler, Elizabeth Lawrance Fowler (my great-great-great-grandmother), and James Bowden Fowler – should the last child’s name be telling me something? As for John Lawrance, he is called “of Cornwall” in all references to his early life, which is really not very helpful. What I’ve been struck by, though, as I look anew at this pair of brick walls, is that Emily Lawrance Fowler’s elder half-sister lived for much of her life in Canada and England – she is probably the Ann Lawrance Bolton of Richmond, Surrey, whose will was proved in 1855. Perhaps it is among her English descendants – if there are any – that I will find references to John Lawrance of Cornwall and New York, one of the founders of the new United States at a time when, evidently, undue recognition of his British origins (and those of his son-in-law) seemed unnecessary! In one of the other boxes is a booklet that Cornelia White a daughter of Joseph gives a pretty detailed family tree It is MS:905. She has a bit of informathion on Dr. White and his parent especially his mother of the Campbell clan. Be prepared they were a terribly contentions group. In the MD Archives at Annapolis, there is a court case that went on for more than 20 years by Joseph White against his father and brothers. Campbell P. moved to NY and was even an elected official – Alderman as I recall. and which I assume you know.. Campbell P.’s brother Joseph, had him arrested when he came to Baltimore one time for supposedly absconding with financial document of the family’s JC. White and Sons Distillery. Note: Susan Hobbs was the daughter of John Hobbs and Elizabeth Bailey – I have used and been a member of NEHGS. Maybe Cordelia can take you back one more generation. “My paternal grandfather’s father was Robert White , a divine of the Dissenting Presbyterian Church and a sons and grandson of ministers. Robert white married Jane Thompson both born in Larn, near Belfast, Ireland (they were cousins) Jane was the aunt of John Campbell, Lt. Gen of the Isle of Jersey and a connection of John Campbell duke of Argyle. Robert White was born in 1725. His ministry is described in a Biography written by Rev’d Mr. Stevenson of Belfast in the possession of my grandfather Dr. White.” Ordained 1755, died of consumption in 1772. Children were 10. She goes on to list the 6 sons their marriages and children the lastest date was 1895. Do you know if there is a DNA study for white male descendants? Ihave cousins that are direct White males. “My” John White father of John Frank/Francis was not a son of John C Jr., Campbell P., Joseph, Stevenson, or Henry but Cordelia lists an eldest son Robert , that I have not found any record. The is also a Dr. Robert White who is listed in a Baltimore death notice in a newspaper notice as a surgeon , brother of Dr. J.C. White who died in Baltimore in 1816. Actually, I have all of these families in a separate TMG family database I did research on the family in 1999 -2000 in DC and Annapolis and then made a trip to 2001 in Baltimore where I was only able to review three boxes. It was all fascinating but could not find proofs any male White grandsons fitting the birth date or of his death in Vicksburg- so sort of have had them inactive. Julie, Robert and John White did not marry, so far as I know, and they lived in Manhattan with their brother Campbell P. White. Only Joseph White/Whyte and Stevenson White left descendants named (at this point) White/Whyte — the Campbell P. and Henry White families daughtered out. Julie, I don’t think the dates work for a son of Dr. John Campbell White born in 1811. He also had a son named John C. White — presumably also John Campbell White — who was a whole generation older than John Francis White. It’s certainly possible that your White family named a son after Dr. John Campbell White — he actually also had three grandsons named in his honor, one of whom (my great-great-great-uncle) later changed his name to Goldsborough Banyer. Interesting. I note that I have some similar middle names in my family. Prosper Montgomery Wetmore, and his wife Lucy Ogsbury, a merchant of New York, named my 2x great grandmother Lucinda Lawrance Wetmore. Several other children had the Campbell middle name. Lucinda married John Jay White. They lived in both the US and overseas. one son was Alain Campbell White. My Whites are from Danbury Connecticut- Ebenezer White, etc. Jennifer, On my desk at the moment is a list of the members of the Sanitary Association of the City of New York in 1865, among them Prosper M. Wetmore and Peter Cooper. Other charitable institutions of the day (and found at thehistorybox.com) include the Society for the Reformation of Juvenile Delinquents, of which my great-great-great-uncle D. Jackson Steward was a manager, and the Woman’s Hospital Association, on whose board sat my great-great-grandmother Mrs. G. L. Beeckman and her sister-in-law Mrs. Henry Beeckman. My brick wall was Margaret Shippen Arnoldʻs husband… who I finally found to be my 4th cousin 6X removed through my Lothrop/Lathrop line… while I certainly donʻt condone Benedictʻs actions, it was rewarding to finally prove a story that I had heard all my growing up years… that we were related to Benedict! The settlement of the estate of John Lawrance, Esq. went on a long time. I presume you have closely examined all of the available estate records for clues. There is also a series of deeds filed all over NY in 1825, conveying their shares of John’s real estate to his heirs. I have one of these (one of my ancestors is mentioned in context of one of the Lawrance parcels). The first page is quite interesting as it mentions deeds and marriage settlements of the married daughters. Tompkins County, NY Deed J:34-65 (yes, more than 30 pages long as recorded). If you have not yet found these, possibly there are clues yet unexamined. Thanks, Jade, I will take a look at the Tompkins County deed! You are the first person I have ever seen with the surname BOUCHER. I have a brick wall on a female ancestor, Sarah Boucher/Bouchter who married Abraham Cortright in abt 1794. She died in 1849 in Luzerne Co, Pennsylvania, and had six children, one of whom is Joseph Richard Courtright who is my ggg grandfather. I know absolutely nothing about her, cannot find any information on the Boucher name. Do you have any sources for this surname that you might be willing to share, so I can possibly have a starting place to start even learning about this name? Carolyn, there was an eighteenth-century Boucher family in Maryland, which might be relevant. As I say, my Bouchers came from Germany (and before that, France), but you might also want to look into French-Canadian Boucher families, who are to be found throughout New England during the nineteenth century. An explanation of the marriage settlements would be a quite interesting blog post. Were there records of these in the Judge’s estate settlement documents, for the daughters who married after his death? Were they perhaps recorded as deeds? What was their legal underpinning?